Edmond Arthur Ashdown. Image courtesy Australian War Memorial. Edmond Arthur Ashdown was born in Mackay in 1881, the first son of Edward Parker and Florence Eleanor Ashdown. Edward was the manager of the Mackay branch of the Commercial Banking Company of Sydney. He was later transferred to Newtown, then Inverell and later Bega. In April 1899 he was appointed manager of the Orange branch, a position that he held until his death in March 1909. Edmond was educated Crown Street Public School, where he served in the School Cadets. 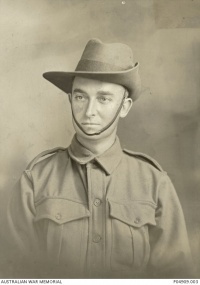 He was living in Mosman and working as a clerk when he enlisted in February 1915. Assigned to the 13th Battalion, he embarked with the 4th Reinforcements on HMAT A9 Shropshire on 17 March 1915. He proceeded to Gallipoli in May, but was evacuated in September with enteritis and septic poisoning. In June 1916 Edmond joined the British Expeditionary Force in France. On 11 August 1916 he suffered gunshot wounds at the Battle of Somme. After repatriation to England for convalescence, he returned to France in December 1916. On 11 April 1917 Edmond was wounded by a shell while acting as an observer outside Battalion Head Quarters. He was conscious when taken to the dressing station by the stretcher bearers but later died of his wounds. He was 36. Edmond is commemorated on the Holy Trinity Church Orange Honour Roll where his father had been a church warden, and on the western face of Mosman War Memorial. He is also commemorated on his father’s grave in Orange Cemetery. Edmond’s name appears on the World War I Roll of Honour on the southern face of the Orange Cenotaph. In 1923 the Anzac Memorial Avenue of trees was planted along Bathurst Road to commemorate fallen WWI soldiers. A tree was planted in honour of “Pte AE Ashdown”; presumably Edmond. It was donated by Dr Arthur Edmund Colvin. Very few of the trees are still standing today. Three of Edmond’s brothers and one of his sisters also served in WWI: Cecil Parker Ashdown was killed in action in France in July 1916, Ernest Ewen Ashdown and Clive Ashdown returned to Australia in March 1916 and August 1918 respectively; Staff Nurse Maud Ashdown was discharged from the Australian Army Nursing Service in March 1917. This page was last modified on 3 February 2017, at 01:05.